"The Elf on the Shelf® is a special scout elf sent from the North Pole to help Santa Claus manage his naughty and nice lists. When a family adopts an elf and gives it a name, the elf receives its Christmas magic and can fly to the North Pole each night to tell Santa Claus..."
So, basically, he's the tattle-tale for the big guy. Oh goody. As if Santa's whole naughty and nice list weren't manipulative enough, now he needs a helper in his quest to control and manipulate? I think not. I don't seek to control or manipulate my son at any time of the year, least of all during the Christmas season when we're especially focused on the kindness, generosity, and loved ones. This is one of the myriad reasons we don't lie to him about the existence of Santa Claus. We both grew up with Santa. We both loved him. We both have fond memories of those years. That doesn't mean the jelly-belly wasn't open to scrutiny when working out our parenting ideals. 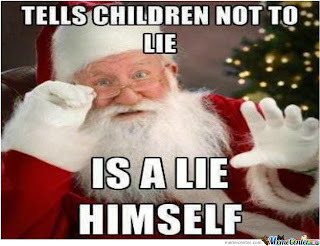 The fact is that Santa Claus is a lie. We can debate all day long about the definition of "lie," but I'm not looking to have a Bill Clinton-esque conversation here. We can further debate the egregiousness of certain lies over others, but to me, someone who values honesty above most else, a lie is a lie is a lie. I never want my son to doubt my veracity, so I'll never lie to him. I make it simple for him to trust me. Of course, then, Elf on the Shelf isn't a "thing" in our home. Now, I grew up with them around, but they were mere decoration in my great-aunt's and grandmother's homes - they didn't dabble in shady dealings in the dark, they didn't tattle, they didn't animate at all - they were decorative Christmas decorations only. It wasn't until I was older that I found out about their intended purpose. It was like someone stopped the record. Uh, no. We'll not be doing that with our son. I'm not up for telling him that he has to be "good" or someone or something is going to punish him. I don't do that to him, so why would I let some other fictional folk do it? We know punishments don't work anyway. 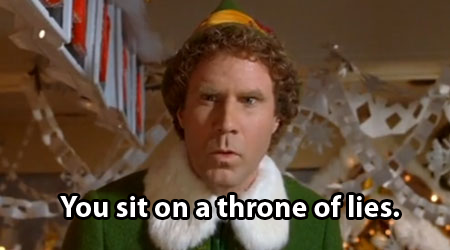 I don't want my son to obey me or Santa or some elf with a penchant for destruction and mayhem. I want him to do what he needs to do based on his own judgement and self-control. He's a person. He's got this. And when he doesn't "got this," I am there to listen, empathize, help, and hug. I'm not there to say, "Do this or else..." nor are a couple of dudes with sugar addictions and long records of breaking and entering. Look, I'm not trying to convince anyone to do things my way. I see why people like the Santa myth. I see why people enjoy the Elf on the Shelf kooky nocturnal antics. I'm simply asking you to consider the bottom line to these, as with all other choices that affect our children. Loved this! I don't do Elf on the Shelf or any fictional character for a holiday, except for Santa, we do him. If it were my choice I wouldn't. To me Christmas is much more than just Santa, reindeer, elves, or what ever. I like to focus more on family, giving(which I try to do every day), and religious aspects. 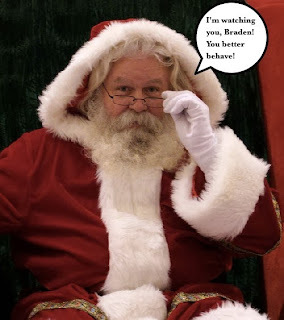 I don't have children yet, but I know I will not "do" Santa Claus, at least not as it is done today. I will, however, tell them the story of the actual Saint Nicholas, on whom Santa Claus is based. He is a Christian saint from the 4th century. He was born in a wealthy family, but was known for his austere style of life and his discreet help to the poor and needy. Legends from the time say he would leave coins in people's shoes at night (tradition still kept in some European countries on 6th December - St Nicholas day). The best known legend says that he has once learned about three daughters of a poor man, who could not afford to give them any dowry, which would prevent the girls from getting married and possibly to force them into prostitution to support themselves, since women at the time did not have many options outside of marriage. The story goes that St Nicholas came to their house quietly in the night and threw three purses full of gold into the house through - according to different versions - the window, the chimney, or that he put them in stockings, that the young women had hung out in the backyard to dry. It's pretty obvious that this old legend is a source of many of today's traditions and I will tell my children that. But I also want to tell them about St Nicholas to focus on giving - I want to start a family tradition (I am actually starting it this year) where we don't give each other presents, but rather we come together as a family and prepare something special for someone who really needs it - whether it will be our time volunteering somewhere or preparing a special gift for a poor or sick child or donating to someone in need. I think the cool thing about St Nicholas compared to Santa Claus is this focus on giving instead of receiving. And none of this "naughty or nice" nonsense, just the pure joy of giving to someone straight from your heart. And of course, you don't have to be Christian to tell this legend to your children, I think it's pretty universal. In my books, it beats the Coca-Cola promoting creepy fat old man. Love it! Thanks for sharing! We as well do not lie to our children about any of this nonsense. The true meaning of CHRISTmas is what we teach our children. They do get gifts from us and family, but maybe in the near future, we will focus more on the giving aspect instead of receiving. Merry Christmas! i can take or leave "santa", depending on how that is presented; but that "elf on the shelf" thing is just creepy! our take on santa has nothing to do with the shakily-identified christian 'saint', as we are not a christian household, but has more been drawn from the pre-existing traditions of northern and central europe. (we don't espouse any particular religion, and like to let childhood be a time of both wonder and exposure to many cultures without indoctrination of any kind.) that said, i feel no need to reintroduce the 'krampus" (interesting as i may find him in a scholarly, folkloric way) or similar figures who threaten to beat or carry off naughty children. 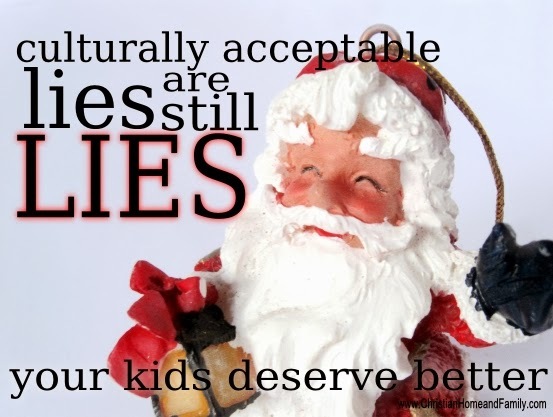 i do not believe that children who grow up without a santa story are missing anything, nor do i feel that allowing a belief in fairies, santa, whatever, is intrinsically damaging to them,as they typically outgrow the belief naturally and without trauma if allowed to do so. i recall having a very brief chat with my daughter, when she was small (about 3 & a half years) about the idea of santa, which she had picked up from friends or relatives...she simple asked if there was a person who brought gifts at yule/xmas/midwinter, and i replied that people have for many, many years liked to believe in a gift-giver who comes at the darkest, coldest time of the year, and that he has had many names in different places. i said also that it was traditional to celebrate with family and friends at the winter holidays, and gift-giving was part of that. she seemed most interested in santa as something about which she could pretend, just as she enjoyed building fairy houses, and i had no problem with that. in our house, we have a sort of 'there are more things in heaven and earth than are dreamt of in your philosophy" kind of attitude. ultimately, her favorite part of the santa mythos was leaving him a gift---ye olde milk & cookies, or spirits & cookies---and she left santa behind very naturally after a few years of having it as part of her seasonal observation. she put at least as much emphasis on other aspects of yuletide, such as the decorating with holly & ivy, or the animal-shaped gingerbread we usually make then, or the candles in the windows on midwinter eve, and definitely the tree-trimming/ daily tree-lighting, as ever she did on santa. Really? You never told your kids fairy tales or bedtime stories? never had a themed birthday party, let them watch a movie? Avatar, The sword in the stone, Alice in wonderland, Wizard of Oz? Never let them have any kind of fantasy play, like driving their cars or playing like they were building a city? I don't believe in the vindictive god, but I don"t go running into churches telling people I don't believe in their god. What ever happened to just letting people enjoy a holiday and if you don't participate, don't put others down...? I can tell how fun You would be to have as parents... NOT. You don't let them read story books? I never presented any of those things as real and certainly never used them against him as a way to control him into behaving as I wish at any given moment. Further, I haven't and won't tell anyone not to believe. Not sure where you got that. I say specifically that I am not asking anyone to do as I do and can understand why others do differently as I do. You've gotten awfully defensive when all I've asked is that you consider another point of view. That's really not that threatening, is it? P.S. If the only thing making Christmas magical is Santa Claus, I'd say that's a sad state of affairs. We read lots of stories and enjoy make-believe play. The difference is that it is make-believe and are presented as such. Telling a child that Santa is a real, existing supernatural being that watches them while they sleep, eat, play, and argue is vastly different from telling children that he is a fictional character, based loosely on a few historical characters. One is a lie, one is not. I believe this is a crucial difference. Agreed. My kids love to watch movies like Superman and Avatar. They also know that it's fiction. We don't lie to them. They do not get money from the "Tooth fairy" nor will they get presents from "Santa". Amy, your first sentence in your reply to Debbie is perfectly phrased. I share your feelings on Elf on a Shelf, and am mystified that it is as popular as it is. 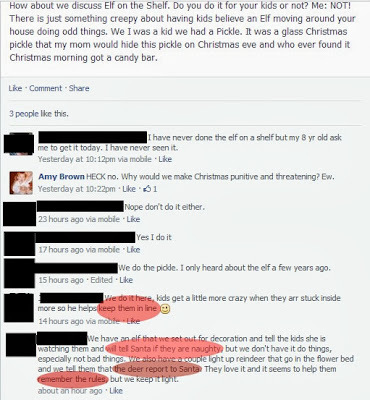 I've heard of parents using it as a silly game where kids find the elf each morning, and I imagine that could be a hoot. But scaring your child into believing that this elf reports back to Santa, watches everything you do.... talk about nightmare inducing. My stomach turns when I read posts from parents having a good laugh at their child's expense, how fearful they were, that their behavior has never been better. What are you teaching? We plan to include Santa in our holiday celebrations, but not in a "he's real and he won't bring you gifts if you're naughty" way. So many other positive, honest ways to enjoy the season. I agree. That first sentence sums it up extremely well. It's the way they are controlling the children with it. No one is telling kids that the family car is going to transform into Optimus Prime and take them out or take away their fun things if they don't eat their vegetable, lol. The intent behind the fairy tales is the good kind of magic. The regular good-natured, anything is possible if you believe, childhood kinda magic. I thought elf on the shelf was cute when I first saw it. Coming up with little cute things for him to get into was fun...but I'm going to pass. This will be my childrens' first Christmas as it has never been a part of our lives until this year. I'm passing on Santa and the Elves and sticking to sparkly, loving, good tidings, and non-religious Xmas. Thanks, Amy! Checking it out now. Thanks! Võng tự đưa với giá máy đưa võng hay võng tự động giúp bé ngủ ngon mà vong em be tu dong không tốn sức ru võng. Võng tự động hay may dua vong tu dong gia re chắc chắn, gọn gàng, dễ tháo xếp, dễ di chuyển và may dua vong tu dong dễ dàng bảo quản.